Almost every kid I know looooves this month. What other time of year do they get to dress up in a costume and get free candy by knocking on stranger’s doors?! I remember going to Halloween parties when I was younger, and bobbing for apples, putting my hands in some dark bowl feeling something cold and squishy that was supposed to resemble brains and getting the you-know-what scared out of me! 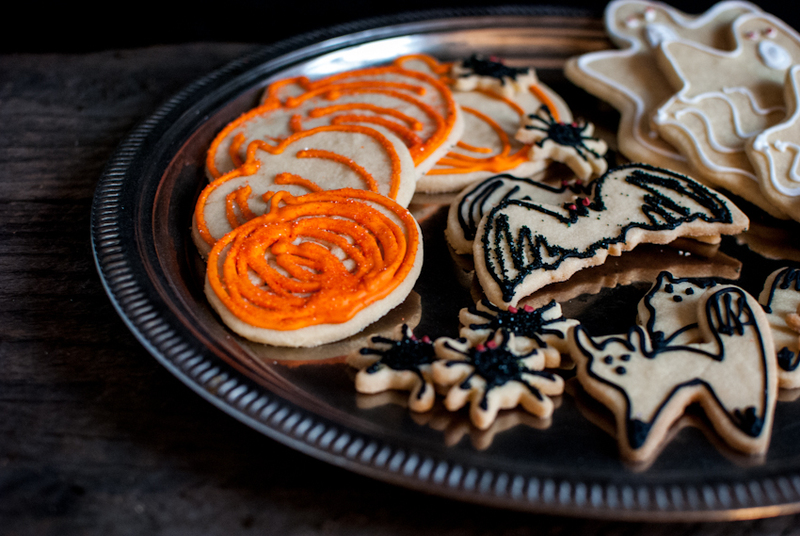 Halloween cookies are always fun to make! 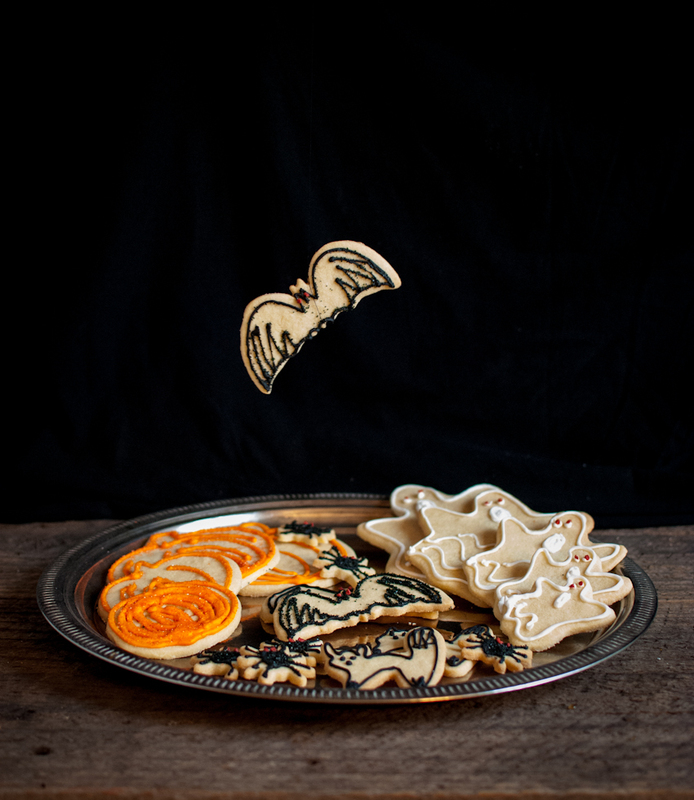 Start with a buttery cookie dough and roll out and press with cookie cutters! Then “draw” the icing on them with fun colored frosting and maybe toss on some glittery sprinkles! So much fun to make. If you have a steady hand, it’s easy to make these cookies. They make look difficult, but really they are fun. 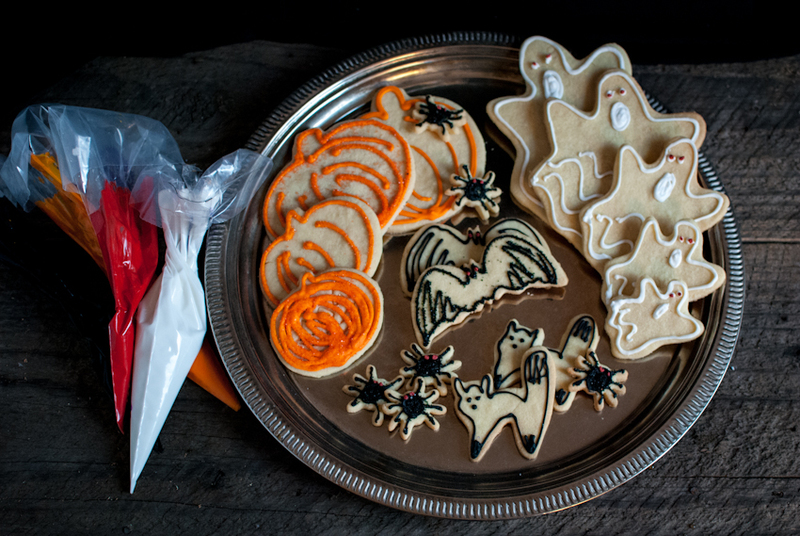 Set aside a few hours in the afternoon with some hot cider and gather the kids together, and create some awesome Halloween cookies! The recipe I use is from my favorite chef of course, Tom Douglas! A major successful chef in Seattle with 10 restaurants and a few cookbooks, he is my idle. Last spring I had the pleasure of going to a cooking demo, had him cook for us, and he signed my cookbook. I was super star struck! If you ever visit Seattle, you must go to one of his restaurants. A-MAZ-ING! His Dahlia bakery cookbook is a must for any home cook. Simple, comforting, delicious recipes are all in this book. And you don’t need any “fancy” ingredients to cook/bake his recipes, it’s just real food! You may be wondering, how I got my orange so vivid and the black so black? I use the food gel coloring, not the liquid found in grocery stores. It really make a huge difference in the color and the consistency. It does not thin your icing and the colors are super vivid. You can find them here for a few bucks or at most kitchen specialty stores or any place that sells Wilton cake supplies. In a electric mixer with the paddle attachment, cream the butter and sugar on medium speed until light and fluffy. Add the egg yolks, vanilla extract and salt, beat until well combined. Gradually add the flour in 3 additions, mixing on low. Scrape the sides of the mixer after each addition. Shape the dough into a ball and wrap in plastic wrap and refrigerate for a min of 2 hours. When ready to bake cookies, preheat the oven to 350 degrees. On a lightly floured surface, roll dough to a thickness of 1/4 inch, working in small batches if needed. Cut as many cookies as you can, set scraps aside. When all cookies are cut, roll scraps only once and cut as many as you can. Do not roll scraps more than once, the dough will become tough. Place cookies 1 inch apart on a parchment lined cookie sheet and bake for 15-18 minutes, until edges are lightly browned. Put the sugar in a large mixing bowl, add the egg white, lemon juice, and vanilla. If you need a thicker icing, add more sugar/ a thinner icing, add more egg white. Transfer icing to small bowls and mix in food gel coloring. Put in piping bags and decorate cookies! Yields about 3 C of icing. Use immediately due to the raw egg white. If you have issues using raw eggs, you can substitute pasteurized egg whites found in most grocery stores.